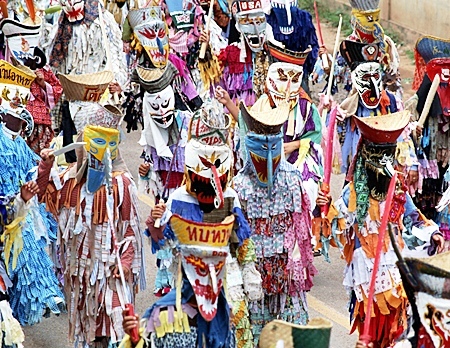 The Phi Ta Khon Festival is unique to Dan Sai District in Loei and begins this Friday, July 1. Chiang Rai will be holding its annual Candle Festival on July 16 when the Municipality arranges a candle parade at Wat Phra Sing. Tung Park, Koam Chiang Rai and Wat Phra Sing will host a series of public events - including candlelight parades, live performances of the traditional Lanna music and candle-making competitions. 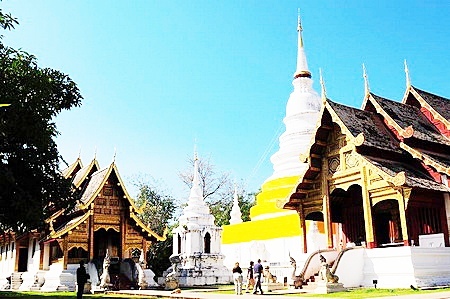 Wat Phra Sing was built in the 14th century, is one of the most popular attractions in Chiang Rai. It is believed the original Pra Buddhasihing image was once resident here before moving to Bangkok. 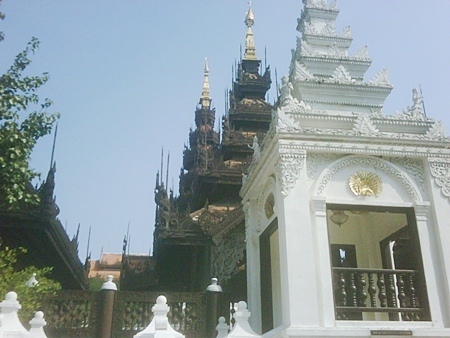 The festival will take place on July 16 with events at Tung Park, Koam Chiang Rai and the main parade at Wat Phra Sing. Oasis Spa opened its latest branch in Kamala, Phuket. The Royal Thai spa features contemporary traditional Thai-style structure with eight elegant treatment rooms each equipped with its own Jacuzzi and Herbal Steam Room. Oasis Spa with its Lanna style identity is the trendsetter in Thailand’s day spa industry with branches in Chiang Mai, Bangkok and Pattaya plans to carry the brand to all major tourist destinations in Thailand. Oasis Spa received the Thailand Tourism Award for Excellence in Day Spa two consecutive times. It was some three hours after midnight on June 15, when four men arrived with a black water buffalo at the foot of Doi Kham Mountain to prepare for a sacrifice, whose tradition goes back to the time of the Buddha. Doi Kham is about 10km in the southwest of the city of Chiang Mai and located in Tambon Mae Hia, Amphoe Muang. 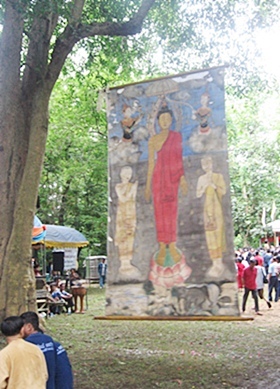 The Phra Bot painting hanging from a tree at the festival. The moon was brightly shining just one night before getting full. Villagers of ten villages had purchased the buffalo a few days before out in San Patong and now one of the men killed the buffalo with a big knife to see how it falls in the forest near the Mae Hia Creek originating from the mountain. After one hour, they moved the animal to another platform with the head and its horns looking east. This was the start of the annual Pu Sae Ya Sae spirit worship ritual, which is nowadays more and more celebrated in style. When I arrived at 6.00 o'clock in the morning, the outlay of the ritual ground was already prepared. The killed buffalo was located within a marked sacred space in front of twelve spirit houses, which were all named according to personalities, which are all worshiped according to the legend. The legend tells of the old cannibal couple of Pu Sae Ya Sae, who lived on the two mountains of Doi Suthep and Doi Kham. Doi Suthep is north of Doi Kham. In the time, when Buddha was still living and traveled the world, he came to a village to take a rest. Thus, the Hindu Gods of Brahma and Indra blessed the village by bringing a rainstorm of gold and silver. As it rained gold at the village, the Buddha predicted that this place will be called Doi Kham meaning "Mountain of Gold" in the future. As it rained silver further north, the mountain there was called Doi Ngoen, meaning "Mountain of Silver" later to be named Doi Suthep. Buddha felt sorry for the defenseless villagers and left to talk to the giants. He asked them to stop eating people and predicted that because of his teachings there will be soon many monks to live in this area. When the two giants heard Buddha's plea, they asked him to allow them to have two buffalos per year instead of people and enlighten them with his teaching. Buddha blessed them by revealing them the five precepts and left. So it comes that even today, in the ninth month of the Lan Na Thai lunar calendar, there still is a forest feast at the foot of Doi Kham for Ya Sae. Actually, a parallel feast for Pu Sae was held at the foot of Doi Suthep, but fell into oblivion a long time ago. The ceremony started shortly after 8.00 o'clock, when some village women prepared the prescribed offerings to the spirits, containing pieces of bread, banana, popcorn, pork skin, sticky rice, sugarcane, tobacco and also water. There were bundles of 24 big silver and small gold candles each. Six trays for the spirit of the soil were prepared along 23 huge banana leave trays for the spirit houses, each containing six cigars and betel nuts. In the south of the ritual area was a "sala" which slowly filled up with visitors to see the spirit medium, a Hang Dong villager in his thirties, who was to be possessed by the spirit of Ya Sae. At 8.20 o'clock the ritual master named "Achan Phromma" (77) appeared to read out the sacred texts to call the spirits to reside in the different houses. Actually, there were two spirit houses for the hermit "Suthep" which were erected in front of the others. Traditional music of drums, pipes, and xylophone filled the air. At 9.00 o'clock the ceremony culminated with the hanging of the "Phra Bot" painting featuring a standing Buddha flanked by two disciples. The banner, which was brought in a black coffin, is as nine arms length and vehemently swings at a branch of a large tree with its back to the ritual ground facing north. Nine monks from Wat Pa Chi, sitting under a tent, recited holy incantations in the Pali language, while from a bronze Buddha image a white cotton string went through the hands of the monks ending in a silver bowl. At 9.30 strange noises were heard from the nearby "sala" and the spirit medium was possessed by the spirit of Ya Sae in front of an altar covered with flower bowls. Shortly after, the spirit of "Suthep Ruessi" was called followed by the others. In the meantime the spirit medium had left the "sala" and straight went to the buffalo to feast on its meat and blood. Then he was guided by former Mayor Boonlert Buranupakorn and others to walk along the spirit houses to end up eating raw meat and drinking blood in a nearby tree. Some visitors tried to ask him for some lottery numbers (5-3-7) etc. At 10.15 the spirit medium left the tree and continued his walk in trance to the "Phra Bot" to worship the Buddha. Going back to the "sala" more and more visitors got excited and tried to get in touch with the medium. Last not least, visitors who had the chance to sneak into the sacred area could ask the possessed man to fasten a white string around their wrists to get health and good luck. At 11.00 o'clock the ceremony was finally over. While the "Phra Bot" banner was covered again in the coffin, fire truck, police car and food vendors slowly went home to wait for the spectacular feast again in the coming year. Some visitors even went home with a small copy of the colorful "Phra Bot" purchased for some 300Baht =10USD each. In spite of the myriad negative news making headlines in Thailand since 2006 and sending travel industry jitters, Thai tourism performances are on a record high. According to the Tourism Authority of Thailand (TAT) Governor’s Speech during Thailand Travel Mart Plus (TMM+) 2011 networking lunch on June 8, the last year 2010 turned out to be excellent and ended up with a total of 15.9 million visitors – a 12.6% increase over the previous year. “This positive trend has continued into 2011” was the surprised conclusion made by Mr. Suraphon Svetasreni, Governor of TAT. During June 8-10, at the Impact Arena in Bangkok’s Muang Thong Thani, TTM+ 2011 under the theme “Caring for the Earth” counted some 1000 participants, including 150 members of the media from 30 countries around the world. Some 368 seller organizations were present, which featured their tourism products within 401 booths at the exhibition hall, and could meet up with some 335 buyers from 54 countries. By balancing existing markets with equal emphasis on new markets, TTM+ included countries such as Russia, India, China, and Indonesia. Buyers and media had the opportunity to join one of seven complimentary pre-tours and were picked up at one of the seven officials hotels, such as the downtown Centara Grand at Central World or the new Novotel Impact. Staying in the Rembrandt Hotel with the support of Swedish GM Mr. Eric Hallin, I opted for the tour called “Golden Buddha Image” that started at 13.00 o’clock on June 7. The visited Golden Buddha Image was enshrined in the newly built Phra Maha Mondop at Wat Traimit in Bangkok’s Chinatown. There the world’s largest pure-gold Buddha, dating back to the Sukhothai period, is housed on the top floor of a four-storied pavilion. Originally, the Golden Buddha Image was completely covered with plaster and only discovered as golden in 1955. On the 3rd floor of the building is an exhibition area that features the history of the Golden Buddha Image, while on the 2nd floor there is the impressive and elaborate Yaowarat Chinatown Heritage Centre, which provides a wealth of information on Bangkok’s Chinatown from the past to the present. Finally, the tour ended at 16.00 o’clock with a stroll through Chinatown packed with market stalls, restaurants, medicine stores, gold shops, temples and spirit houses. Now in its tenth year, TTM+ is the region’s leading trade show for Thailand and the Greater Mekong Sub-region (GMS), which includes Cambodia, China, Lao PDR, Myanmar and Viet Nam. Sadly to notice, there were no official representatives from China, Cambodia and Viet Nam this year. But when TTM+ ceremonially opened with a top modern dinner reception on June 8, everybody was assured that TTM+ was nevertheless surpassing all expectations. On June 9, there were media briefings of Thailand Convention and Exhibition Bureau (TCEB), Airports of Thailand (AOT), and last not least, TAT. Under the “Believe in Thailand” campaign, TCEB has seen a rapid recovery of the MICE industry and the return of MICE visitors to the country. TCEB President Mr. Akapol Sorasuchart announced a new initiative to build on this success to further build Thailand’s image and presence in the high-end “Luxury MICE” market. For this campaign Bangkok, Hua Hin, Chiang Mai, Phuket and Koh Samui were selected as chic and charm destinations to offer captivating experiences and services of unrivalled standards. The message is out: Thailand is providing inspiration for your business success and will be the gateway to the ASEAN region with a population of over 500 million. AOT announced the plans to develop its responded airports in Thailand to be world class airports together with green and clean policies. Senior Executive Vice President in Business Development and Marketing, Mr. Nitinai Sirismatthakarn, revealed that AOT has successfully operated six international airports, such as Suvarnabhumi Airport, Don Muang Airport, Chiang Mai Airport, Mae Fah Luang-Chiang Rai Airport, Hat Yai Airport and Phuket Airport, which all must function in an environmentally friendly manner. Air Bagan: The airline operates average of 25 daily sectors, serving 19 major domestic destinations as well as Yangon - Chiang Mai – Yangon on a twice a week regular charter flight (see www.airbagan.com). Chatrium Hotel Riverside Bangkok: Located on the banks of the majestic Chao Phraya River, the hotel offers 396 rooms and suites as well as a ballroom with seven additional function rooms of various sizes. There is also the 5-star Chatrium Hotel Royal Lake in Yangon/Myanmar, which offers 303 guestrooms and an outdoor swimming pool (see www.CHATRIUM.com). Mekong Cruises: The Laos-based company has operated river cruises on the Mekong River since many years and now opened The Luang Say Residence in Luang Prabang, which is the pinnacle of luxury, providing 20 pioneer suites in 5 colonial pavilions and 4 other explorer suites located in the main building (see www.mekong-cruises.com). Moevenpick Resort & Spa Karon Beach Phuket: Its 159 suites and secluded villas feature sundecks and outdoor rainforest showers. The main building offers 175 upscale rooms, most with sea view, while Moevenpick Residences Karon Beach has 30 beachfront apartments in an integrated resort concept. Furthermore, Moevenpick operates city hotels in Hanoi and Ho Chi Minh City in Vietnam and plans to open Moevenpick Suriwong Hotel in Chiang Mai this year (see www.moevenpick-hotels.com). Orient Express: The Singapore-based company takes tourists beyond the conventions of today’s luxury travel. Whether you plan to stay in Koh Samui in Thailand, Luang Prabang in Laos or Siem Reap in Cambodia, travel in Bali, wish to take the Eastern & Oriental Express or discover the Ayeyarwady River in Myanmar aboard the “Road To Mandalay” cruise ship, the company’s experiences offer an alternative way to discover Asia (see www.orient-express.com). Pandaw River Cruises: The Company is the largest luxury river cruise one in Asia. With five luxury ships exploring four countries, such as Myanmar, Cambodia, Viet Nam and Borneo, there also is the Pandaw charity program, where Pandaw passengers are keen to give back to the communities they visit (see www.padaw.com). Patong Paragon Resort & Spa: Located at the most popular beach on Phuket Island, the international deluxe resort offers 121 well-equipped rooms and suites as well as a large free-form swimming pool (see www.patongparagon.com). Phi Phi Natural & P.P. Erawan Palms Resort: Executive Director Mr. Vithaya Lamyai explained it with great enthusiasm. It is a tropical paradise with white sandy beaches, crystal clear water and a colorful reef in front of the resort. Just come down to Krabi to feel it (see www.phiphinatural.com). Rembrandt Hotel & Towers Bangkok: Offering 407 superb rooms and suites, it is centrally located at Sukhumvit Road Soi 18, not far from many shopping and entertainment places, also BTS Sky Train and MRT underground metro stations. Try the Indian cuisine Rang Mahal Restaurant at the 26th floor and relax with an Ayurvedic Oil Massage at The Spa of the 5-star hotel (see www.rembrandtbkk.com). Serenata Hotels & Resorts Group: The group now owns 13 multiple brands of hotels and resorts in idyllic locations, such as The Legend Chiang Rai Boutique River Resort & Spa in Northern Thailand as well as the Paradise Koh Yao Boutique Beach Resort & Spa in Phang Nga, Southern Thailand (see www.SERENATAhotels.com). The Chedi Chiang Mai: The property belongs to the GHM Hotels and is an 84-room hotel and spa located in the centre of Chiang Mai along the Ping River. Its colonial-style restaurant is offering the best Indian cuisine in town and is housed in the former British Consulate. Other famous GHM Hotels are the Nam Hai in Da Nang/Viet Nam and the Strand inYangon/Myanmar (see www.ghmhotels.com). Lastly, there were a cluster of booths featuring “Chiang Mai Creative City” and some booths of the Japan National Tourism Organization. Furthermore, buyers and media could book one of the six post-tours starting on June 11 and featuring “The Spirit of Lan Na” – “The Charm of Isan Life” – “Jewel of Andaman” amongst others. Next year, TTM+ 2012 will be held again in Bangkok, but the GMS event will be scheduled back to back in Chiang Rai, when the annual Mekong Tourism Forum (MTF) will taking place there, as Chiang Rai is celebrating its 750 Years Anniversary. The Mandarin Oriental Dhara Devi is famous for its unique atmosphere and fantastic reconstructions of Thai buildings. Readers of prestigious publication, Travel + Leisure, US June 2011 edition have awarded Mandarin Oriental Dhara Dhevi, Chiang Mai the No. 1 position worldwide for service in the annual World’s Best Awards survey. The hotel gained top honours for best service in both the Overall and Asia categories. “We are extremely proud of this recognition from the readers of Travel + Leisure. This award is testament to our daily mission of providing the legendary service that Mandarin Oriental Hotel Group is renowned for, and to the commitment and passion of our colleagues to create lifelong memories for our guests” commented Greg Liddell, General Manager of Mandarin Oriental Dhara Dhevi, Chiang Mai. To celebrate this achievement and allow guests to experience the resort’s service first-hand, Mandarin Oriental Dhara Dhevi, Chiang Mai is delighted to present a Sheer Indulgence offer - valid for stays from 1 June to 31 October 2011. 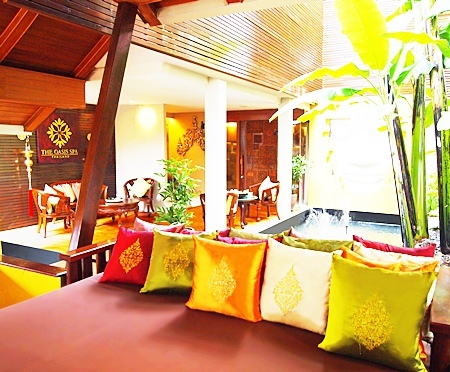 Guests will receive a complimentary 60 minute Thai Massage for two persons during each stay. Sheer Indulgence rates start at THB 15,899+ + + per night for a minimum of two nights. Guests can select from a wide variety of luxurious villa-style accommodation, and enjoy a room upgrade. One of Southeast Asia's most charming cultural heritage destinations Luang Prabang in Laos is fast approaching a tipping point and will soon come under threat. According to the new Luang Prabang Hotel Market Update by leading hospitality consulting firm C9 Hotelworks, a large-scale airport expansion and high-speed railway are major indicators of imminent change. C9 Hotelworks Managing Director, Bill Barnett, said that a runway expansion capable of handling wide-body aircraft will open in 2013, and the following year a high-speed railway link to China will become operational. Key research data showed 2010's year-on-year growth in airport passenger arrivals of 14% tallied in at 77,978. Growth in average room rates compensated for a slight dip in market wide occupancy. A slow-down in tourist arrivals was driven by two important source markets, Thailand and the UK, which declined 43% and 16% respectively. Political events and currency deprecation accounted for the trend. Recent developments on the ground include the opening of a 18-hole golf course by a Korean joint-venture company which includes more phases for a 250 room hotel and 100 upscale villas. The existing hotel supply of 44 hotels will increase 16% by 2012. Two new branded properties from the Anantara portfolio highlight the pipeline. As to the impact on what has largely been a sustained low impact tourism footprint during the last decade, Mr. Barnett added: "A short term identity crises looks inevitable as one chapter closes and another is set to begin. "Unfortunately the next development cycle looks set to focus on growth for growth's sake, which is at odds with the destination's unique DNA. Airlift and rail access improvements will see the emergence of new opportunities for a wider range of hotel products due to an overall upward progression. I expect to see a new mid-scale hotel tier emerge as the broader market edges towards more reliance on volume."